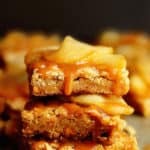 Butterscotch Apple Bars – The perfect fall treat: Delicious Apple Bars topped with melted butterscotch are the most wonderful apple dessert recipe to enjoy during Autumn. These Butterscotch Apple Bars are seriously so good that I had to back away from the table and stop myself from eating another. I’m telling you this gives any Caramel Apple Bars recipe a run for its money. 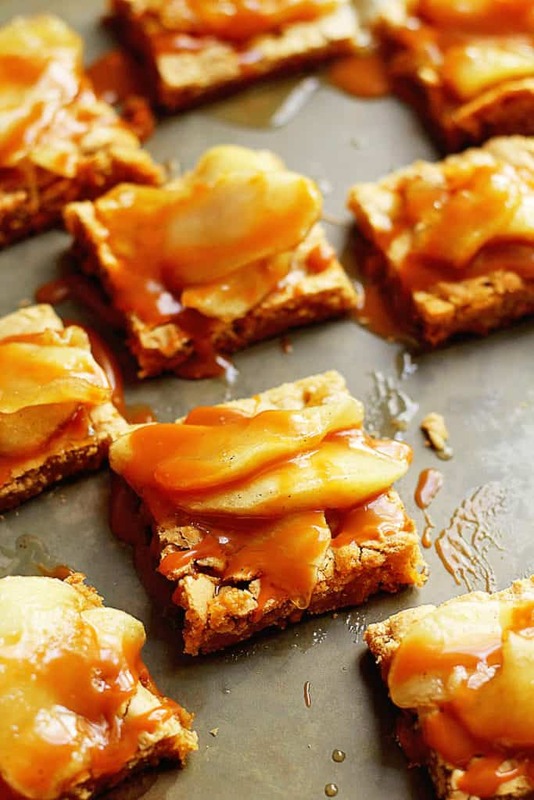 This butterscotch apple bars recipe is decadent, chewy, sweet and just dessert perfection. I am really proud of these, considering how simple they are to make. I know we spend a lot of time in our kitchens during the Fall and Winter. Sometimes we want to spend hours on the perfect comforting meal, and then sometimes we are totally tired, wiped out and just want something sweet that won’t take too much time to prepare. This apple bars recipe is that perfect compromise because it tastes like hours were spent in the kitchen but this recipe is made in a snap! I admit that I have been a bit tired and worn out this fall but these apple bars gave me all the incentive in the world to go in the kitchen. The original recipe from BHG for Butterscotch-Toffee Bars looked unbelievable to start. I loved seeing that there was actually a bar recipe that gave butterscotch a starring role. This totally could have been a caramel apple bars recipe but just how typical would that be. Though I have done tons of scratch baking, the fact that these started with cake mix intrigued me. The yellow mix was the perfect base for these though. It provided the softness and tenderness the recipe needed. These bars seriously melt in your mouth. I, then, sauteed apple slices in butter, cinnamon and sugar until tender and added them to the top of the bars, along with an easy microwaved butterscotch sauce made with butterscotch chips, which I also added to the bar batter. If you are ready for something decadent, delicious and absolutely easy, this recipe for Butterscotch Apple Bars is the one for you! Delicious butterscotch apple bars made with cake mix and topped with a simple apple butterscotch mix. In a large bowl, combine cake mix, brown sugar, melted butter, and eggs. Beat with an electric mixer on medium speed for about 1 minute or until combined, scraping bowl occasionally. Pat dough into prepared pan. Sprinkle with butterscotch chips. Bake in the preheated oven for 15 to 20 minutes or until a toothpick inserted in center comes out clean. Cool completely in pan on a wire rack until room temperature. Cut into bars. Makes approximately 32 bars. Add butter to pan over medium low heat and melt. Next stir in brown sugar and cinnamon then add in apples. Allow the apples to cook in the sauce until they become tender and sauce develops (about 7-12 minutes). Set aside. Add butterscotch chips to microwave safe bowl then pour milk. Microwave at 20 second intervals and whisk after each session until combined. It usually takes about 1 minute. If sauce is too thin, add more chips, if too thick, add a bit more milk and whisk until smooth. Spoon apples over each of the bars along with butterscotch sauce and serve. Great combination! These look fantastic! I might just surprise my kids with these in their lunch boxes tomorrow! Those looks so amazing! Love that butterscotch drizzle! I love butterscotch! These look incredible! These look like the best autumn day on a plate. Yum! They are the best for autumn. These bars are simply out of the world good! Looks absolutely delish, I’ll need to make these for the boyfriend soon! 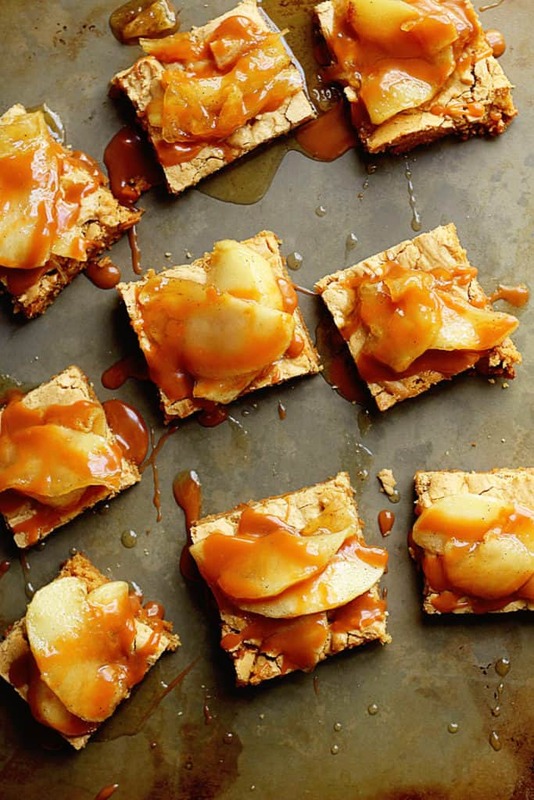 Give me all the butterscotch apple bars you’ve got. Yum! I will definitely check out the recipe. I’m a sucker for anything butterscotch! Good grief, Jocelyn, these are delectable! When things are just crazy, I love using a few shortcuts (like cake mix) to make my life easier. My cake mix treats never turn out this gorgeous though 🙂 Totally want to give them a try! What beautiful, amazing bars! Loving all the butterscotch! These are definitely worthy of an Oprah Check. <3 Loved meeting you at the Bake-off! Oh my! Those apple slices on top! Droooooling! I love bars. Plus everyone else seems to love bars too. So it’s fun to bake them. Excellent recipe. These bars look amazing and have one of my favorite flavors in them, butterscotch. These look insanely good, Jocelyn! Love all that caramel on top! Love how simple this is but looks sooo delish! These bars look amazing! I love butterscotch, and I bet it pairs so well with the apples! These bars are dripping with sweet, sweet flavor. These are some epic fall bars. Pinned. These look absolutely to die for Jocelyn! I love that they have so many butterscotch chips in them! You’re killin’ me with these Jocelyn, WOW!!! What a long day home and I am wishing I had these before bed. So great meeting you this weekend! Seriously I can’t believe it took you so long to get home! Thanks so much Matt! It was awesome meeting you too! The topping just looks so decadent! I too love me some cake mix recipes. The topping makes it taste totally scratch. I love the apple and butterscotch topping on these bars! Ohh thanks so much Amanda! There’s something about bar desserts that’s always so decadently delicious and satisfying. That butterscotch would make anyone swoon! These apple bars look too good! Thanks so much Monica! I love bar desserts too! You are killing me with ooey gooey butterscotch this week! And 3 steps seriously? Have to try these! Pinned! I am having quite the butterscotch love week! oh my gawd!!! 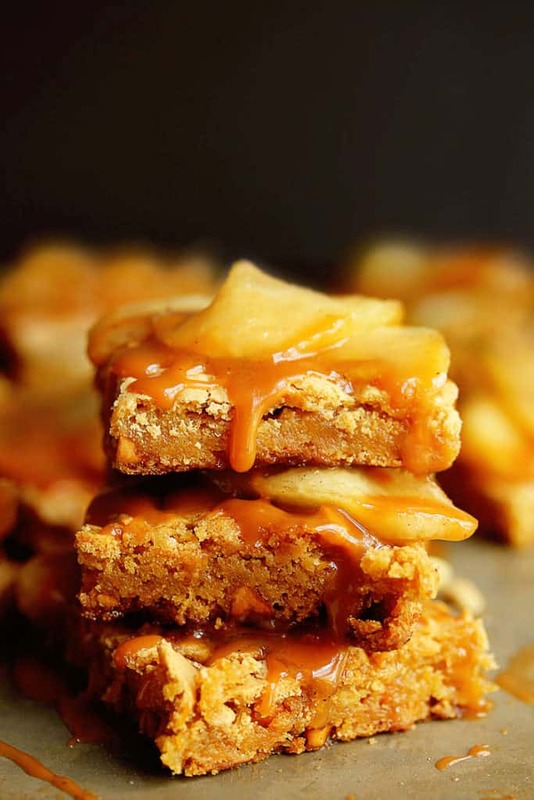 I WANT THESE butterscotch apple bars!!! Wowza .. great photos, yo! The sauteed apple slices in butter, cinnamon and sugar and added on top is heaven. Damn. Girl I kept closing my eyes after each bite. I need help!! Amazing bars Jocelyn! I love the butterscotch sauce drizzled all over the delicious apple goodness! It is so insane Danae! I wish I had one of these in my mouth right now. They look amazing. Jocelyn. Jocelyn, I think you just converted me to an apple butterscotch fan. They look totally beautiful! I’m sure I’ll go for another trip to the kitchen and grab a bite. Yes it is such an awesome combination seriously! Are these for real? Oh my gosh they’re beautiful!! They look amazing! I wish I could have them with tea right now. Oh these sound awesome with tea! Thanks Melissa! Thanks so much Brooks! It takes a lot of restraint!